Continues with its GS9/GS9+ BOGO, but on 3/26 is likely to launch a $300 GS9/GS9+ trade-in offer and a $200 GS8/GS8+ trade-in offer. Continues with an iPhone BOGO in Philadelphia and in Florida is advertising an offer that provides two lines of unlimited at $80/month for those aged 55+. Continues with a popular $300 discount on the Pixel 2 XL and a $100 discount on the Pixel 2, although these are likely to end during a 4/5 reset of promotions. Has made it cheaper and easier to get unlocked devices approved for Verizon’s network, amid plans by OEMs to launch “GSM+Verizon” unlocked devices. Will end the 2/15/16-3/31/18 $650 ETF buyout offer at the end of March, except that it will continue in New York, Chicago, and Los Angeles. Is doing more local marketing, with localized radio ads pitching two-hour GS9 launch events in 15 markets. The Los Angeles event involved a street team. Has launched a new line offer for three low-end Android devices at $1/month, amid what could be an effort to bolster its postpaid base by moving subs from prepaid to postpaid. Has had a surge in wireless ad spending – taking the top slot among carriers over the past week – while Verizon’s spending has slumped. Is again offering tablets almost for free with contract after a hiatus since last fall. Continues apace with its iPhone/LG BOGO offer that requires a new line and its offer of a free new family line if one is added, but Galaxy devices were dropped from the BOGO. Has increased the price of two lines of service on its unlimited plan for customers 55+. Assuming a $5/line autopay discount, the price is now $70, versus $65 previously. No longer requires a new line for its LG BOGO. Has slashed GS8 pricing twice recently and the phone now costs $600. The GS8+ is no longer on the website of T-Mobile or Sprint, but is still sold in stores. Is trialing new Unlimited Freedom HD and SD switcher plans in six markets. The pricing is complex, but amounts to a large price increase. Is touting new line BOGO offers on the GS9/GS9+, the iPhone 8/Plus, and iPhone 7/Plus, as well as offers of the iPhone X and LG V30+ for $20/month with new line. Continues a new customer offer at some Best Buy, Target, and Walmart stores that provides 6GB for $40/month. Has admitted to laying off 500 and it now appears that this number has been exceeded, with many getting word of layoffs since 3/16. Is holding a #SprintSaturday event on 3/24, which is featuring waived activation fees on the GS9/GS9+. Xfinity Mobile through 4/8 is offering $250 off with purchase of any of five high-end Galaxy smartphones and addition of a new line. U.S. Cellular has increased the price of unlimited, with a switching family of four now paying $160 per month, versus $140 before. BOGOs rule. All carriers have major BOGO offers that all require a new line of service, aside from LG BOGO with T-Mobile and Sprint. The BOGOs are the dominant offers from three of four major carriers. Verizon does have a BOGO on the GS9/GS9+ and a BOG in Philadelphia on the iPhone, but is to trade in a top smartphone (iPhone 8, GS8, etc.) to get the $350 discount. Nearing a consensus on free or nearly free Android devices with new line. Until 3/16, AT&T did not have any offers that provide a low-end Android phone for free or at a deep discount with new line, but now three are available for $1/month and the iPhone SE is $5/month. Sprint has two phones free for those adding a line, while Verizon has long had one free phone and two deeply discounted phones with new lines. T-Mobile currently does not have such an offer for consumers, but the carrier has long pushed affordable $150-225 Android phones. T-Mobile does have an offer for business customers that provides a free Galaxy J3 or REVVL with new business line. Some national retail reps are referring to low-end Android devices as “value tier” phones. 1 line 2 lines 3 lines 4 lines Hotspot 3 Mbps? HD video? Xfinity Mobile $45 $90 $135 $180 Included No ? Note: Sprint’s promo is not for existing customers. AT&T and U.S. Cellular pricing also assumes paperless billing. The U.S. Cellular promo requires phone insurance. For T-Mobile, HD is provided if customer purchases $10 T-Mobile One Plus add-on. New T-Mobile customers get four lines for $140 under a promotion. AT&T launched the Enhanced plans on 3/1. – iPhone 8/Plus BOGO, new line req. For customers on device payment plans, smartphone line charges are $20 for Verizon and AT&T. AT&T’s current shared data plan (Mobile Share Flex) pricing as shown assumes autopay and paperless billing. Price is $10 higher otherwise. Source: The iSpot database. Rank is national TV ad spending among all U.S. advertisers. Spending is for wireless, meaning that AT&T/Verizon ILEC and DirecTV spending is excluded. Some AT&T spending blends DirecTV with unlimited wireless. Verizon is airing an enterprise IoT ad that focuses on how IoT can aid commercial fishing in oceans. – TV: Verizon ad spending has slipped, as Verizon was the 13th most heavily advertised brand in the U.S. over the past 30 days, compared to 7th in February and third in January. Since 3/16, one major area of focus has been the offer of up to 50% off the latest iPhones with trade-in of high-end smartphones. – Radio: Since 3/13, Verizon has aired a 60-second radio ad ~700 times in Philadelphia in which it promotes the iPhone BOGO offer that is available only in Philadelphia. The $150 port-in offer is also mentioned. Verizon’s radio ad spending is at a low ebb and there is no other radio advertising of note currently. – Online: The GS9 BOGO, Fios, the $150 card, and the new GS9 on a “better network” are some new themes. The Pixel 2 is another theme. – Outdoor: Verizon has a modest amount of digital billboard advertising touting unlimited starting at $40/line. – Up to 50% off iPhone X/8/8+ with trade-in (3/16-4/4): Verizon is offering a variety of trade-in values for purchase of iPhone X/8/8+ with trade-in of a smartphone and addition of a new line. Details are here, but to get $499.99, a customer would have to purchase an iPhone X and trade in an iPhone X, an iPhone 8 Plus, a GS8+, or a Note 8. Trade-in value varies according to SKU purchased and phone trade-in, with one variant providing only $199.99. This can be combined with an offer that provides $150 for porting a number to Verizon. – Expired: $350 GS9 trade-in offer (3/2-15): Verizon on 2/25 announced a 3/2-15 offer providing up to $350 for trading in a phone and purchasing a GS9 or GS9+ on EIP. Customers got $350 for trading in an iPhone 8/Plus, an iPhone X, a Note 8, or a GS8/GS8+. Customers got $300 for trading in an iPhone 7/Plus, an iPhone 6S/Plus, any GS7 model, any Pixel, top LG phones (G6 or V30), or a Moto Z Force or Z2 Force. There was also a $200 tier (iPhone 6, GS6, etc.) and a $100 tier (iPhone SE, GS5, LG G4, etc.). In ads, Verizon pitched this as a $500 offer, including $150 for porting a number. – Pixel $300/$100 discount (2/15-3/31): Verizon is offering a $300 discount on the Pixel 2 XL and a $100 discount on the Pixel 2. The offer is available to new lines and to most upgrading customers. There is signage for this at Target and Sam’s Club. The Pixel 2 has an endcap at Best Buy. The effort appears successful, as Wave7 Research’s March survey indicated 8% Pixel share at Verizon stores, with one rep saying the Pixel 2 and Pixel 2 XL have comparable sales despite having the same $549.99 price, assuming the 64GB version. Checks indicate that the older Pixel is unavailable now at most Verizon stores. There is signage for this offer at Target. – Galaxy trade-in offer (3/26-4/4): Verizon has told dealers that it is likely to launch a 3/26-4/4 GS8/GS9 trade-in offer. There will be a guaranteed trade-in value of $200 for the GS8/GS8+ and $300 for the GS9/GS9+. The phone traded in must have an assessed value of $35 or $100, likely with the $100 applying to the GS9/GS9+. – $150 port-in credit (3/2-4/4): For port-in customers, Verizon is providing a $150 credit. The credit was boosted from $100 to $150 on 3/2. – $150 military BYOD port-in credit (ongoing): There is a $150 credit for military BYOD customers who port a number to Verizon, which is similar to the broader $150 port-in credit. Also, there is a $15 military discount on unlimited. Verizon’s military page is here. There is some minor radio advertising in support of this offer. – $500 winback promotion (3/15-4/30): Verizon currently is targeting select former Verizon customers with $500, net of $300 for trading in a phone that must have already been paid off, plus a $200 Mastercard gift card. To get the full value, the customer must remain with Verizon for at least 45 days. Reps are asked not to bring this up proactively. It appears that only a small number of targeted customers are eligible. – $20 Fios/wireless bundle discount (2/1-4/18): Customers who subscribe or upgrade to both a Verizon Wireless Unlimited data plan and a Fios Gigabit Connection double- or triple-play bundle get a $20 discount off their bill ($10 off wireless and $10 off Fios). Details are here. – Free/discounted low-end Android with new line (3/2-4/4): Verizon is providing a $7/month discount on the $168 Asus ZenFone V Live, making it free with new line. There is a $5/month discount on the $240 LG Stylo V2, taking the price to $120. Also, there is a $7/month discount on the $408 Moto Z2 Play, taking the price to $240. Checks indicate continued traction, with stronger sales in suburban areas than in urban areas. – Go90: Go90 is a non-factor for Verizon with no retail visibility. Digiday on 12/5 discussed Go90 in a report headlined “Pivot to nowhere: The once-vibrant market for digital video series has deteriorated.” On 2/13, Oath CEO Tim Armstrong said that Go90 was being folded into Oath and hinted that the brand would be discontinued. – “Best network. Best unlimited,” with pricing of $40/line is one sign in many store windows. Some stores lack window signage. “Welcome to America’s most awarded network” is a large sign inside stores. Some signs pitch a $300 discount on the Pixel 2 XL. Prominent iPhone X, Samsung, and Pixel displays are seen. There are Motorola and LG displays in some stores, but not in others. No Droid displays have been seen for some time. – Online, Verizon is now providing free SIMs with BYOD activations and pitching plans that start at $35/month (2GB plan) with Carryover data. – Verizon is embracinng unlocked phones far more than in the past, according to a source. The source said that the cost to puget a device tested in Verizon’s lab has been slashed to a fraction of what it was, only costing tens of thousands of dollars now. Some OEMs are now designing “GSM+Verion” devices, the source said, adding that it was still more difficult to enable a device for Sprint. – During 3/2-4/4 in Philadelphia, Verizon is offering a BOGO (value of $699.99) on the iPhone X, iPhone 8, and iPhone 8 Plus. Unlimited and a new line are required, but no trade-in is required. This offer is similar to a national iPhone BOGO in market 1/29-3/1. A radio ad in support of the offer has aired ~500 times. – Verizon continues with its 2/22-5/23 promotion in Florida that provide customers age 55+ with two lines of Go Unlimited at $80/month or one line of Go Unlimited at $60/month. A 60-second radio ad has aired 1K times in Florida since 2/26 and Verizon is running newspaper ads in Florida also. A source familiar with national retail has said early results of the promo are positive. – Verizon currently is displaying a pitch for the GS9 BOGO on GS9 display models. – At Best Buy, electronic signage currently touts the GS9 BOGO, $400 off the Pixel 2 XL (net of $300 in bill credits and $100 in instant savings), up to $350 for trade-ins with purchase of the GS9/GS9+. There is a large sign with these offers in rotation. – Monthly pricing seen for Verizon phones at a Kansas Walmart on 3/18 were the $8 Samsung Convoy 4, the $0.75 Galaxy J3 Eclipse, the $27.08 Pixel 2, and the GS9 and GS9+, both with handwritten labels and unclear pricing. – Verizon is offering a $100 credit for new SMB lines. There is also a business discount of $200 on iPads, assuming iPhone purchase and two-year contract. Business offers are here. – At Target, the Pixel 2 continues to have its own display space. “The new Google Pixel 2 on the best network,” read signs. At the retailer, Verizon also has signage pitching Go Unlimited at $40/line and Beyond Unlimited at $50/line. – At Costco during 3/16-22, there was signage pitching the $350 iPhone X/8/8+ and the GS9/GS9+ BOGO. Details on Costco offers are here. – TV: During the week of 3/15-21, AT&T spent a remarkable $22M to air the “More for Your Thing: Getting Serious” ad, which pitches the iPhone 8 BOGO. AT&T TV spending is currently elevated largely due to sponsorship of the NCAA Basketball Tournament. – Radio: Since 1/22, AT&T has run a pair of 60-second ads 28K times pitching the prepaid offer of two lines for $75 along with two free ZTE Maven 3 phones. A Spanish variant of this ad has aired 13K times since 1/27. Since 2/12, a 30-second ad touting the BOGO has aired 8K times. – Print: AT&T has been running FSIs in major newspapers pitching its TV/Internet bundles, driving customers to att.com/shopbundles. There has been a barrage recently of print ads in many markets touting Lifeline wireless. – Online: Themes have been the $65 and $45 prepaid plans (before $5 discount with autopay), business unlimited, and the BOGO. – Outdoor: AT&T uses less outdoor advertising than its competitors, but there is some bus shelter advertising for the BOGO offer. – Late Winter BOGO (2/23-now): AT&T has a BOGO on high-end smartphones. The iPhone X has not been in the offer, apart from inclusion during 2/9-22 and AT&T announced its inclusion in Los Angeles as of 3/1. There is no TV requirement now and sources say this has helped AT&T results. There is minor signage for the GS8 part of the offer. “Hey LA, get the amazing iPhone X on us” is a sign seen at Target stores in Los Angeles. – 50% off the GS9 with trade-in, switching, and purchase of GS9 (3/16-4/2): With new line on Next, AT&T is offering 50% off the GS9. If a customer activates new TV service, the offer can also apply to upgrades. There is a comparable offer with the GS9+. – “Value tier” smartphones $1/month with new line (3/16-31): With new line on Next, AT&T is providing three low-end smartphones, the Galaxy J7, the Galaxy J3, and the LG K20 for $1/month. The K20 is free with new line for customers ordering new lines during March. Checks indicate a lack of signage and marketing for this offer and for the $5/month iPhone SE offer. Wave7 Research believes that either advertising and signage are yet to occur or perhaps AT&T’s strategy is to have the offer as a quiet tool to close deals on new lines. These phones now have improved visibility at some Target stores. – iPhone SE $5/month with new line (3/16-31): A new line is required. – Expired: Up to $500 off with trade-in, switching, and purchase of GS9 (3/2-15): During GS9 preordering, AT&T offered up to $350 for trading in a device and $150 for porting to AT&T for a maximum of $500. – Chicago Free Internet Offer (3/1-5/31): In Chicago, AT&T is offering free 50 Mbps landline Internet for life to any customer who switches to AT&T wireless and chooses the Unlimited Plus Enhanced. – $300 TV credit (9/22-now): AT&T is offering wireless subs up to $300 in credits for buying new DirecTV or U-verse TV service. The landing page is here. This offer has been supported by email marketing. – $300 LG V30 credit (3/2-now): Three is a $300 minimum trade-in credit with LG V30 purchase (minimum value $20). Customers at national retail must visit an AT&T store to complete the transaction. Thanks to LG, there has been TV ad support for the offer. There is tiny signage for this at AT&T stores. – iPhone/iPad bundle (3/23-now): The 32GB iPad is $0.99 and the 128GB iPad is $99.99 with two-year contract and iPhone purchase on Next. – Gear bundles with Galaxy smartphone (1/5-3/31): With Galaxy smartphone purchase, Gear S2 is $.99 and Gear S3 is $49.99 on contract. – Free ZTE Maven 3 with new activation (10/6-now): AT&T is offering a free ZTE Maven 3 with new activation on a plan of $35+. This is available at all AT&T stores, but not at national retail or online. In February, six-foot tall signs were added to some stores around the U.S. There is heavy radio touting this offer. Signs in stores pitch two free Maven 3 phones along with two lines of 6GB at $75/month. – Signage pitching unlimited data at $40/line is in the windows of a minority of AT&T stores. “Bundle wireless, DirecTV, and Internet to save more,” reads gigantic signage on one wall of AT&T stores checked recently. “DirecTV is #1 in customer satisfaction over cable for 17 years running” reads another giant sign. At a few corporate doors, there is a sign in windows pitching AT&T Fleet Complete. “Optimize your fleet, asset and ELD management with our all-in-one platform,” the sign reads. Customers are told to arrange an appointment with a Fleet Complete specialist. “Learn how to get 50% off the new Samsung Galaxy S9,” reads an 8”x11” sign. – AT&T is showing renewed interest in local marketing efforts, often using radio. Since 3/5, AT&T has aired a localized 60-second radio ad in Los Angeles 400+ times. Los Angeles is the only market where the iPhone X is part of the BOGO. Shortly before the GS9 launch, AT&T aired localized ads touting the $500 GS9 trade-in offer and driving customers to GS9 launch events, which generally were slated for a certain AT&T store between noon and 2:00 p.m. on Saturday 3/17. This tactic was used in Los Angeles, San Francisco, Seattle, Chicago, Miami, Cincinnati, Tampa, San Diego, Portland, Phoenix, Las Vegas, Charlotte, Boston, Denver, and New Hampshire. A radio ad in Cleveland drove customers to a new AT&T store in Westlake, Ohio. The Los Angeles ad promised an appearance by the “KRTH Street Team.” A newspaper ad in New Jersey on 3/16 drew attention to a new store in Montvale, NJ and touted the iPhone BOGO. – AT&T is set to end its $650 switcher buyout offer in most of the U.S., with a last day of 3/31, Wave7 Research has learned. It will continue to be available in New York, Chicago, and Los Angeles. The offer provides up to $650 in credits per line when customers trade in a smartphone and buy a new smartphone on Next. Verizon had a similar offer, but 10/8/17 was its last day. Details of the offer from AT&T are seen here and here. AT&T announced the offer on 2/15/16. – At www.cityswitchsweeps.com, AT&T is urging customers to switch their carriers and switch their cities, as there is a sweepstakes for customers in New York to win a trip for two to Los Angeles and for customers in Los Angeles to win a trip for two to New York. To enter, a customer has to visit an AT&T store and post a picture to Twitter or Instagram that features an AT&T product under consideration. No purchase is required to enter the sweepstakes. The effort is slated to end on 4/15. Hashtags being used are #CitySwitchSweepsLA and #CitySwitchSweepsNY. A 60-second radio ad launched in both cities on 3/20 and has aired 200+ times so far in both markets. – AT&T during 3/1-4/30 is offering open enrollment on device protection. During this time, customers may choose the AT&T Multi-Device Protection Pack, the AT&T Mobile Protection Pack (MPPP) including MPP for Business, and AT&T Mobile Insurance. Flyers with bills have touted open enrollment. – On 3/10, AT&T launched an offer that provides two tablets – the Tab E and the AT&T Primetime for 99 cents with contract. The Gear S2 is also 99 cents on contract. AT&T on 3/21 launched a new offer that provides the iPad 32GB for 99 cents and the iPad 128GB for $99.99 on contract with purchase of any iPhone on Next. Both must be purchased in the same transaction. AT&T largely stepped away from free and nearly free tablets last fall, but appears to have reversed this decision. – There are 8”x11” signs in some AT&T stores pitching an offer of three free months of service and free activation with purchase of the Apple Watch 3. – An AT&T rep on 3/21 estimated that at his store, 45% of activations were on the high-end unlimited plan, versus 40% on the low-end unlimited plan, with 15% choosing Mobile Share Flex. – Monthly pricing seen at a Kansas Walmart on 3/18 were the $1.70 Galaxy J3, the $10.97 LG X Venture, the $14.80 GS7, the $19.97 GS8, and the GS9 and GS9+, both with handwritten labels and no clear pricing. – Bills to AT&T customers in March had multiple promotional flyers, including one touting protection plans starting at $8.99//month, with open enrollment during 3/1-4/30 and referring customers to att.com/devicecoverage. Another flyer pitches DirecTV and drives customers to att.com/BrowseDTV. – AT&T has pulled its Axon M endcap from Best Buy, based on sources and checks. The Axon M launch has been unsuccessful, based on Wave7 Research checks and surveys. – Radio: Since 3/16, T-Mobile has aired a 60-second ad 7K times that touts the GS9 50% off promo and states that this is “the fastest Samsung ever” and T-Mobile has “the fastest network ever.” During 2/21-3/15, a 30-second ad pitching the iPhone 8 BOGO has aired 4K times. – Online: Recent themes are “4 for $35,” “Fourth line free,” inclusion of taxes and fees, recruitment, and business wireless. “The fastest Samsung ever demands the fastest network ever” is an ad that also pitches 50% off the GS9 with trade-in. – Outdoor: T-Mobile actively uses outdoor advertising. Two current billboard themes are coverage in given markets and the BOGO offer. – 1Q18 BOGO offer (1/12-now): T-Mobile on 1/10 announced an offer that provided 12 smartphones from Apple, Samsung, and LG free via a BOGO that required a line to be ported to T-Mobile. A phone must be traded in also. The offer applies to the iPhone 7 and more recent iPhones, plus the LG V30 and G6. Galaxy devices were dropped from the offer several weeks ago. The LG portion of the BOGO no longer requires a new line as of several weeks ago. – GS9 50% off, with $360 or $200 trade-in credit on the GS9/GS9+ (Ongoing): T-Mobile is offering $360 in credits with trade-in of GS7 variants and more recent Galaxy devices and iPhone 6S variants and more recent iPhones, as well as the Note 8 and the LG V30 and V30+. Customers get $200 in credits for trading in iPhone 6 and 5S variants, the iPhone SE, as well as GS6, GS5, and GS4 variants, as well as the Note 4, the Note 5, and certain LG phones (G6, G5, and V20). Details are here. – Expired: Half off GS9 preorder with trade-in (3/1-15): T-Mobile on 2/25 announced a preorder offer on the GS9 that provided the device for up to half off with trade-in. To get the full $360 off, customers had to trade in a GS7 variant, a GS8 variant, a Note 8, an iPhone 6S/Plus, an iPhone 7/Plus, an iPhone 8/Plus, an LG V30, or an LG V30+. The amount was $200 for lesser devices, such as GS5/GS6 variants and iPhone 6/5S variants. – Add a line, get a line free (2/10-now): T-Mobile is offering a free line when one is purchased. In a press release, T-Mobile asserted, “So take those new lines and use them on anything you want … a smartphone, tablet, smartwatch, Nest Secure to help keep your valentines safe or T-Mobile SyncUp Drive to turn your car into a 4G LTE hotspot!” Since March 4, there has been signage for this in the windows of T-Mobile stores. – #GetOutoftheRed offer (5/31-now): T-Mobile is offering to pay off iPhones (6S and newer), GS8/GS8+ devices, and Pixels for customers who switch from Verizon. This effort dominated T-Mobile TV advertising in late summer 2017. Details are here. Verizon’s stated plans to lock its phones could impact this offer. – Business new line offer (1/5-now): T-Mobile is providing a business new line offer that provides a free REVVL or J3 Prime or a $150 discount on the iPhone 7. As of 3/21, T-Mobile is also offering an Alcatel A30 tablet free with plan to business customers. – ”Add a line to your family plan, get a line free” is a sign in T-Mobile stores windows, along with “America’s best unlimited network” at some stores. There is an A-frame sign in front of many stores pitching 50% off the GS9. “Epic sale” is a sign in some windows. “Now get Netflix on us,” pitch small signs on doors. – T-Mobile on ~3/15 increased the price of two lines of service on its unlimited plan for customers 55+. Assuming a $5/line autopay discount, the price is now $70, versus $65 previously. The original price (autopay included) for one line was $50 and that price continues. Verizon during 2/22-5/23 is offering Florida customers 55+ two lines of Go Unlimited for $80, assuming autopay and paperless billing, with one such line priced at $60. T-Mobile COO Mike Sievert recently said, “This unlimited 55+ offer we brought to market has been fantastic because it’s really going after prime AT&T and Verizon customers, and giving them a tipping point to finally switch.” T-Mobile announced the 55+ plan on 8/7/17. – On 2/28, T-Mobile cut the price of the GS8 from $750 to $696 and in mid-March it was cut again to $650. GS8+ pricing was also cut from $750 to $696. On ~3/16, the GS8+ was dropped from T-Mobile’s website, although checks indicate that stores still have inventory. In February, T-Mobile dropped the LG V30+. – T-Mobile recently dropped the requirement that customers add a new line to take advantage of the BOGO offer on the LG V30 and G6. A ported line and a trade-in still required with the iPhone BOGO. – Eight top T-Mobile executives are traveling around the U.S. to high-energy regional meetings with employees. The #UnstoppableTour hashtag is being used and the #AreYouWithUs theme has high visibility at the events. The first event, for the Southwest Region, occurred in San Diego on 3/14-15 and additional events are slated for Dallas, Philadelphia, San Francisco, Chicago, and Atlanta. In San Diego, the first day was focused on T-Mobile’s future and the second was focused on transforming the customer experience in stores. Another topic has been digital transformation and the hashtag #DigitallyAcceleratedRetail has been used on Twitter. – T-Mobile continues to use stores on trucks in California to build awareness of stores. On 3/21 a truck was seen near a California store. “Switch to America’s most advanced LTE network was on the side of the truck. – T-Mobile is using “takeover” signage as an advertising tactic. Currently, a commuter ferry between New Jersey and New York is painted stem-to-stern in magenta. “America’s Best Unlimited Network” is on the ship. – T-Mobile has added lowband LTE to hundreds of sites over the past few weeks, CTO Neville Ray has tweeted. Details are here. – Financing is not an option at Costco and T-Mobile is sold at nearly all 450 Costco stores. Signage is prominent for two lines of unlimited at $60 for customers 55+. “Say goodbye to monthly phone payments” and “All unlimited, all-in” are two signs at Costco. During 3/16-22, signs tout a $100 card for buying a GS8/GS8+ and $360 in savings for purchasing a GS9/GS9+ and trading in select devices. Costco offers are here. – TV: Sprint ranked 14th in national TV ad spending during the last 30 days, compared to from 10th in February and 19th in January. Most of the advertising features Paul Marcarelli and the main themes are “5 for $100,” iPhone offers, and Galaxy offers. – Radio: Sprint since 2/10 has run a 60-second ad 33K times that pitches the iPhone 8 BOGO and the offer of the iPhone X at $20/month ($30 in Feb.). Since 11/17, Sprint has aired a 60-second ad 10K times that touts its Galaxy offers and “5 for $100.” Since 3/16, a 60-second radio ad has aired 2.4K times that pitches the 3/24 #SprintSaturday event. The GS9 BOGO and Galaxy Forever are touted and the ad has appeared in many markets. A 60-second ad touting the GS9 BOGO has aired 2.3K times since 3/16. There has been a solid amount of localized radio advertising in Localization 2.0 markets, including Dallas, Miami, and Cincinnati. – Online: “Tax refund? Get a new phone,” pitched a February ad for the GS8 and there was similar advertising for the $12/month GS8 Active and the $18/month Note 8. Some recent themes are “5 for $100,” the iPhone X at $30/month (now $20), military discounts, and business unlimited at $19/line. – Print: Sprint has been running ads in USA Today and Business Week claiming the best price on business unlimited and driving customers to sprint.com/businessunlimited. – “5 for $100:” Sprint continues to offer switchers five lines of Unlimited Freedom for $100 and the current expiration of the discounted pricing is 3/31/19. This is priced as one line for $60, two for $100, and lines 3-5 free, with HD video. The offer now appears to be unavailable in Minneapolis, St. Louis, New Orleans, Charlotte, Atlanta, and Phoenix. – GS9/GS9+ BOGO (3/16-4/12): With GS9 purchase and addition of a new line, Sprint is offering a free GS9 net of a $33/month credit on the GS9 or $38/month on the GS9+. – Expired: GS9 up to $350 trade-in offer (3/2-15): Sprint announced a trade-in value of $350 with preorder of the GS9/GS9+ and trade-in of the iPhone 8/Plus, the GS8/GS8+, or the iPhone X. There were also tiers at $250 and $150. A new line was required. The offer was pitched as combinable with a $150 Visa card for porting to Sprint, making it a $500 offer. Sprint is touting the GS9’s HPUE capabilities. – iPhone X at 50% off or $20/month (3/2-now): Sprint is offering the 64GB iPhone X at $20/month with new line. If the 256GB variant is chosen, a $150 down payment is required. This offer was announced on 3/2 and it has strong support via ads and signage. – iPhone 8/Plus BOGO (1/19-now): Sprint is offering a free iPhone 8/Plus if one is bought and a line is added. There is very heavy ad support and signage to promote this offer. – Used iPhone 7 offer (2/9-now): Sprint on 2/9 launched sales of used iPhone 7 units at $349.99, but the price is $299.99 if a line is ported. Sprint is also selling used iPhone 7+ units at $399.99, but the price is $349.99 if a line is ported. A 90-day warranty is provided. This offer is visible online and is being advertised on Facebook, but has no visibility at stores checked. – One Year Free (6/9-now): Sprint since June has offered a free year of service to customers who bring a device to Sprint. Sprint on 8/1 said that it “represented 1% of our postpaid phone gross additions in the quarter.” Wave7 Research sees minimal impact from this showcase of Sprint digital transformation efforts. – iPhone 7 BOGO: With new line, Sprint is offering a free iPhone 7/7+ with purchase of an iPhone 7/7+. – Two lines of unlimited for $50 with unlocked devices (11/10-5/5): At Best Buy and Costco, Sprint is offering two lines of unlimited for $50 (or one for $35 for one year) when a customer activates unlocked phones. Based on checks and sources, this offer has okay performance, but is not highly successful because customers prefer top smartphones (iPhones, Galaxy devices, etc.) to unlocked devices. – Moto Z2 Force $11/month (12/9-4/5): Sprint has an offer that provides the Moto Z2 Force at $11/month for new lines and upgrades, versus $33/month originally. – Free low-end Android: The free low-end Android offer continues, with the Moto E4 featured 7/14-4/5. The offer requires purchase of two phones purchased with one new line. Details are at www.sprint.com/freephones. In mid-February, the $145 LG Tribute Dynasty became free with new line, but a California rep on 3/5 said that even though it is free, only two customers have taken the Dynasty, so the E4 still seems tops at the low end. – V30+ $20/month (ongoing): The V30+ costs $20/month with new lines. There is minor TV ad support for this. – $10/month loyalty credit (ends 4/5): At Best Buy and stores, there is a $10 loyalty credit for customers who upgrade from a legacy plan, including Unlimited My Way, My All-in, and Everything Data. – Expired: $200 BYOD offer: Until recently, Sprint had an offer of $200 for customers who added a line and brought a device to Sprint. The offer was $350 if a Pixel 2/XL was involved. – $150 business port-in credit: Currently, Sprint is offering $150 port-in credit for business lines. – Signage is prominent in windows of Sprint stores for the “5 for $100” switcher offer and “A new way to see the Galaxy” (GS9/GS9+). Inside stores, there is prominent signage for the GS9 BOGO, “LG G Pad on us,” the iPhone X for $20/month, “Bring your own phone,” and the LG V30 at $20. “Ask about our pre-owned smartphones,” pitches one sign, touting used phones starting at $10/month. “OLED display in the palm of your hand,” reads the V30 sign, pitching the $20/month price point. Signage touts the free LG G Pad. There continue to be small PokeStop signs in windows. – Wave7 Research on 3/7 broke the story that Sprint was trialing significant increases in pricing for switchers. The report noted that these trials launched on ~3/4 in Minneapolis, St. Louis, and Phoenix, with Sprint trialing HD and SD plans. Sprint on 3/5 launched a TV ad in Phoenix and St. Louis with Paul Marcarelli pitching four lines of HD at a price point of four lines for $35 each, or $140. This is net of a $5 “HD discount” that will expire after 12 months, a $10 porting discount, and a $5 autopay discount. Sprint confirmed the trials to Fierce Wireless, adding that trials are also occurring in Atlanta, Charlotte, and New Orleans. Details are here. – Many Sprint employees on 3/16 and since have been informed that they are being laid off, sources have told Wave7 Research. The Kansas City Star reported on 3/9 that 500 employees were being laid off at the carrier’s headquarters in Overland Park, KS. The layoffs occurring on and since 3/16 are largely in the field, with many employees who handle relationships with dealers losing their jobs. Also, there have been losses among positions in sales support, store results reporting, finance, and customer care. This marks the third phase of Sprint’s layoff effort, as the first phase, detailed by Wave7 Research in January reported that the number of regions was reduced from 16 to eight, amid job losses by regional executives and staff. The Kansas City Business Journal reported on 3/23 that Sprint has relocated some of its digital transformation from Overland Park to Reston, VA, where Chief Digital Officer Rob Roy is based. It has not been confirmed that layoffs impacted Yellow Fan Studios, Sprint’s in-house ad agency, but the agency has only uploaded one video to YouTube during the last four months. It appears that some layoffs also occurred at the retail level. – Weeks ago, Sprint has informed 365K more customers about their introductory pricing expiring on 3/31, following 300K+ whose pricing expired on 1/31. So far, sources point to little known impact. A Sprint source on 3/22 said that reps, via Next Best Action on Sprint’s i-Connect intranet, have a variety of solid options, varying according to customer tenure, payment history, and other factors. Some are getting MRC discounts, with at least a few getting continuation of their half off pricing. – Sprint currently is waiving its $30 activation fee for customers who order online and pick up phones in stores. – Sprint recently launched a new 6GB $40 offer at some Best Buy, Target, and Walmart stores. Per signage, the plan is “only available in select locations” and it is unclear what percentage of Best Buy stores have this pricing. The offer has been observed in California, Indiana, and Kansas. – There are signs at Sprint stores pitching free SIMs with BYOD. Store managers were told that 2018 would be “the year of BYOD.” Also, there are 2’x3’ standing signs headlined, “Bring your own phone.” A list of eligible phones is here, but the eligible devices are largely iPhones newer than the iPhone 4S. For some models, only Verizon iPhones can be activated. Others include Pixels, Moto phones, and Galaxy Special Edition phones. – There are life-sized cutouts of Paul Marcarelli near the doors to some AAA stores. AAA has 1.1K stores in the U.S. Sprint’s main AAA offer is to pay off renewals of AAA memberships. A discount of $50 on Unlimited Freedom or a 10% discount on other plans is provided, as well as 25% off select accessories. Details are here. – During checks at a Missouri Sprint store on 3/18, a crowd of 18 Pokemon Go players was observed standing near the store. Sprint continues to have small signs noting that they are PokeStops. However, a California rep on 3/19 said that interest is low and added that interest has fallen since 2017. – At Target currently, there is signage for “5 for $100,” “Give T-Mobile the pink slip” ($650 buyout offer), the 4GB $40 plan, and the new line offer of $100 for credit union members. Signage for the national retail 6GB $40 plan has been seen at most Target stores checked, but not at all. Sprint’s $40 4GB plan is still sold at Target and it is also sold at the small minority of Walmart stores where Sprint is sold. There are indications that Sprint could be sold at an increasing number of Walmarts by summer. – At this link, there is an offer of a $150 card for switching to Sprint and buying a GS9 or GS9+. There is signage for this at Sprint stores. – The black version of the Moto Z2 Force is out of stock online, although the gold version is available. – Sprint phones at a Walmart checked on 3/18 had monthly pricing of $6.05 for the LG Tribute HD and Galaxy J3 Emerge, the $11.25 LG Stylo 3, and the $11.25 Galaxy J7 Perx. – There is an ongoing partnership between Sprint and H&R Block. H&R Block brochures are seen at some Sprint stores. Xfinity Mobile during 3/16-4/8 is offering $250 off with purchase of a GS9, GS9+, GS8, GS8+, or Note 8 and addition of a new line. The offer requires a new line of service and the $250 prepaid card is sent out after 90 days of service. On 3/19, a source said that Chicago and Houston are key markets that Xfinity Mobile has targeted for new stores, but that the hurricane that hit Houston was a setback for this effort. During 3/9, Wave7 Research encountered a woman who has switched from Sprint to Xfinity Mobile. She has two Xfinity Mobile LG X Power devices on her account. The woman said that she was severely overcharged by Sprint and that she was attempting to get a refund from the carrier. She seemed happy with service from Xfinity Mobile. Best Buy has major signage touting up to $350 off the GS9/GS9+ on select devices with Verizon, AT&T, Sprint, as well as with unlocked GS9/GS9+ phones. The offer is in place during 3/16-24. Best Buy offers are here. Target trade-in pricing, as seen during a 3/18 visit, was $120 for the 64GB AT&T iPhone 6 Plus, $86 for the 16GB Verizon iPhone 6, $230 for the 128GB iPhone 7, $88 for the GS7, $180 for the 64GB AT&T iPhone 6S Plus, $100 for the 16GB Verizon iPhone 6S, and $235 for the Verizon GS8. Swatters from T-ROC, a labor outsourcing company, are seen increasingly at Walmart stores during recent checks. The swatters are heavily incented to push postpaid, not prepaid. This is an effort to address the weakness of postpaid at Walmart, as checks indicate that postpaid comprises <10% of sales at most Walmart stores. Sources say this effort is successfully boosting postpaid sales at Walmart and that the swatters are likely to be deployed at 1.3K+ Walmarts sometime this year. T-Mobile: In 4Q17, T-Mobile had 891K postpaid phone net adds amid low postpaid churn of 1.18%. The carrier announced an improved porting ratio of 1.68 in 4Q17, versus 1.53 in 3Q17. Porting in 1Q18 was improved over 4Q17 levels as seen above (albeit slightly weaker versus Sprint), which bodes well for 1Q18 results. CFO Braxton Carter updated this on 3/7 to say that through 3/6, the figure is now 1.7, up from the 1.68 guided during the earnings call. He said the numbers have in recent weeks been slightly better versus Verizon and AT&T, but flat or slightly worse versus Sprint. Also, the new free line offer and ongoing multi-OEM BOGO seem likely to support strong 1Q18 results. COO Mike Sievert recently said that T-Mobile is getting to a position of being able to win over “prime suburban families,” given T-Mobile’s increasing leadership in net promoter scores, network, and other categories. He also said that business flow share is several times business market share, leading to strong growth of business lines, with improving performance among enterprises and government customers. Gains of 595K in 3Q17 included 165K transfers from prepaid, with 170K transferring in 2Q17. T-Mobile’s overall strong performance appears to reflect continued success of Uncarrier initiatives, reduced churn, the addition of low-band spectrum, broader LTE coverage, the opening of more stores (1.4K+ new stores in 2017), business gains, and the success of T-Mobile One. T-Mobile on 1/9 reported that 40% of the Fortune 1000 does business with T-Mobile as do 37 state governments, and noted new contracts with the cities of New York and Los Angeles. In November, T-Mobile announced its first contract with the U.S. Navy, although Verizon and AT&T also have Navy contracts. Sprint: Sprint had 184K postpaid voice adds in 4Q17, compared to 279K in 3Q17, 88K in 2Q17 and 42K in 1Q17, although churn ticked upwards from 1.65% in 2Q17 to 1.72% in 3Q17 and 1.71% in 4Q17. Churn was 1.57% in 4Q16. CEO Marcelo Claure recently commented, “I’m still not happy with churn” and CFO Michel Combes on 3/7 said that churn was likely to crest in 2018, then fall I 2019. He said that Sprint’s adoption of 18-month leasing (vs. a 24-month EIP) has been a negative for churn. Sprint’s porting ratio versus T-Mobile has improved slightly versus T-Mobile into early February, although with a 1.4:1 ratio, Sprint is still losing customers to T-Mobile. Reps interviewed recently point to significant Sprint churn that is largely network-related. An account manager in the Midwest on 2/21 said that his region “is not killing it,” but is more than meeting quota, but he added on 3/22 that March has been soft in his state. A second account manager on 3/7 sounded mildly pleased with sales and a national retail source on 3/6 sensed “solid performance” for Sprint. Store traffic has seemed solid. Sprint in January informed 300K+ customers about 2/1 price increases due to “exploding offers” (e.g., 50% off until 2/1/18) and in March informed another 365K customers about their “exploding offer” dates. Sources have said that so far, negative reactions to these bill increases have been surprisingly minor, with reps having some leeway to provide deals to keep customers with Sprint. Other upcoming “exploding offer” dates include 6/1, 1/1/19, and 2/1/19. Sprint had 12 fewer stores in November than it had in May, net of 145 new corporate stores minus 157 fewer dealer stores. Sprint’s porting ratio has improved slightly versus T-Mobile from 1.45 in 4Q17 to slightly below 1.4 as of 3/6. Verizon: Verizon’s porting ratio has been weakening versus T-Mobile, going from 1.2 in 2Q17 to 1.61 in 3Q17 to 1.7 in 4Q17 to 1.91 during 1Q18 through 2/7. It slightly weakened again during 2/8-3/6, as T-Mobile CFO Braxton Carter said on 3/7. In 4Q17, Verizon gained 431K voice lines and 193K tablet net adds, compared to 274K voice lines and 91K tablets during 3Q17 and 358K voice lines and 2K tablets during 2Q17. With increased unlimited penetration, overage-related churn has fallen. A Verizon store manager on 2/19 said that he is meeting his quotas. AT&T: Sources have said that the 10/27-12/26 end of the DirecTV/U-verse TV requirement for the BOGO was positive for sales, providing a tailwind. TV was linked again during 12/27-1/11, but has been delinked since 1/12 and sources in 1Q18 are again positive about this change. Given this tailwind and low churn of 1.12%, AT&T gained 329K postpaid voice lines in 4Q17, compared to losses of 97K in 3Q17 and 89K in 2Q17. T-Mobile has indicated porting versus AT&T has ticked upwards from 1.63 in 2Q17 to 1.71 in 3Q17 to 1.8 in 4Q17 and to 1.84 in 1Q18 through 2/7, so results seem to be softening. Carter said that porting results got slightly worse for AT&T during 2/8-3/6. Also, the number of AT&T stores fell by 32 between May and November. Carter on 3/7 suggested that AT&T’s strong postpaid net adds of 329K during 4Q17 were partly fueled by BYOD additions, with customers of questionable credit quality activating new lines. Carter believes that these customers could have a negative impact on AT&T churn in the future. AT&T’s 3/16 move to offer the Galaxy J7, Galaxy J3, and LG K20 for $1/month with new lines could represent an effort by AT&T to migrate customers from prepaid to postpaid. Verizon – On contract, iPads are $150 off or, with iPhone purchase, $200 off. The Ellipsis 8 HD is $149.99 and the Ellipsis 10 is $199.99 on contract. The 32GB Galaxy Tab E and the Galaxy Tab S3 are currently 50% off on contract. The ZenPad Z8s is $149.99 and the ZenPad Z10 is $229.99. AT&T – AT&T on 3/24 launched a new offer that provides iPad 32GB for $.99 and iPad 128GB for $99.99 on contract with purchase of any iPhone on Next. Both must be purchased in the same transaction. AT&T on 3/10 launched a new offer providing the Tab E, AT&T Primetime, or Gear S2 for 99 cents with contract. Since 3/2, AT&T has been providing the 32GB iPad for $49.99 and the 128GB iPad for $149.99 on contract, versus the previous offer of $99.99 and $199.99, respectively that was in the market during 12/29-3/1. For business customers, since 11/7, there has been an offer of a $25 credit with upgrade on installment plan. T-Mobile – No current offers on any new tablets. Stores checked are displaying three tablets, the $240 LG G Pad X2 8.0, the $240 Galaxy Tab E, and the $144 Alcatel A30. – Sprint requires unlimited with tablet activation and pricing is $30/month ($25 with autopay). In March, a Wave7 Research analyst had a 1,070-mile road trip across much of Kansas, Missouri, Illinois, and Indiana. The trip provided an opportunity for an informal survey of wireless billboard advertising. In all, there were 11 billboards seen from wireless carriers, with 10 of 11 coming from postpaid carriers. None were seen for AT&T, as usual, and there was one from T-Mobile. There were two digital billboard ads for Verizon, both pitching unlimited starting at $40/line. Sprint has a billboard touting “5 for $100” and a giant, seven story tall wall ad touting Sprint for small businesses in Kansas City. And the surprise winner? It was Chariton Valley Wireless. 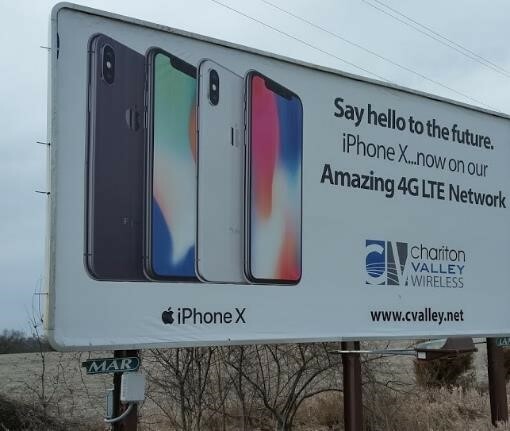 “iPhone X…now on our Amazing 4G LTE Network,” pitched all five signs from Chariton Valley Wireless seen during the journey. The rural carrier operates an LTE/CDMA network and is an ILEC across part of northeastern Missouri. Its website is here and an interview with CEO Kirby Underberg is here. Investor interest is limited, as the YouTube interview with the CEO has a total of 16 views.